SCT63090 series connector 250# with the gold terminal, 2, 3, 4, 6 contacts. Scondar offers SCT63090 Series connector #250 with the gold terminal, along with the complete package: The male housing, female/receptacle housing, female and male terminal, all manufactured with precision-fitting and durability ensuring accurate mating. Scondar’s 6mm and 9mm Pitch connector is composed of the wide flat blade tab terminals, multi-configured modular housing and terminal position assurance inserts for modularity and design flexibility in many applications. Also, Scondar showcases other features such as positive lock and TPA secondary lock, single row system and spring style mounting ears. The SCT63090 is compatible with AWG 14-18 wire and can handle up to 12 amps and 250 volts. Scondar features a molded dimple for ease of mating, orientation identification, and reliable mating of connections. The dimple will serve as a visible mating guidance to prevent connection misorientation. With options for color coding, you can easily identify and manage the connections when color matching of housing and wires are done. This can significantly help for easy installation and easy cable management. Most HVAC applications typically utilize similarly-configured wire-to-wire connectors. With color coding, incorrect connector insertion and mismating can be prevented. The 6mm and 9mm pitch wire connector also offers harness design options for design flexibility according to your needs, and features an easy harness assembly to reduce time and cost during installation. This can be used to applications subject to shock, vibration or rough handling that can dislodge terminals and cause signal interference. Built with friction and positive lock options, this connector provides high-retention force for a reliable connection in rugged environments. The support for high voltage and current (250V/12A) features a more robust build. The variety of Terminal Position Assurance (TPA) types, not only facilitates correct mating, but also gives the insurance that terminals are fully locked in the correct position. The housing will accept both male and female terminals, and are polarized to eliminate and prevent mismating. The different wire-to-wire connector types are equipped with RMF solutions for lower friction solution between the contacts, making insertion and removal of the device easier, while eliminating the need for complex mechanisms. The system provides design flexibility and modularity for a variety of appliances such as White Goods/HVAC applications: refrigerators, washing machines, heating units, and ventilators. 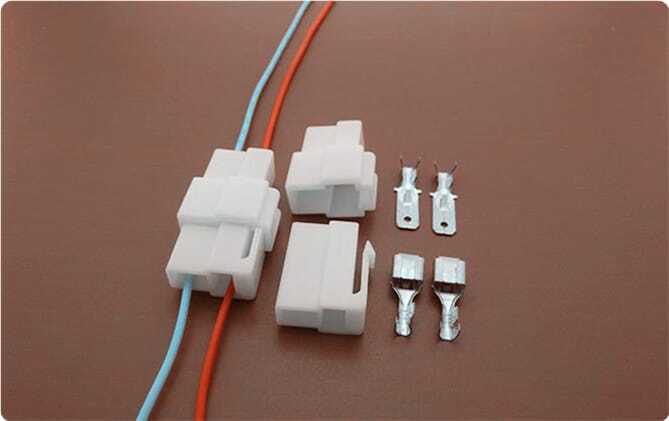 You can expect that your wire-to-wire connector package is undisturbed during the trip and has maintained its vitality even during your production stages, which is why a lot of our customers has raved about our product for both cheaply-priced and has a quality performance.